The holidays are upon us and another year is in the books. But before we move on to the excitement of next year, we wanted to take some time to look back at 2015 and to reminisce about a few of the great things it brought to the world of DC Entertainment. Whether it was a remarkable development inside one of our comics, a cool, game-changing twist that played out on the screen, or a real-life change that will impact the comics, movies, TV shows, toys and games that you’ll be seeing from us in the future, this year had no shortage of moments that stood out. However, some resonated more than others. Some really stood out. These are DCComics.com’s “Ten Moments that Mattered” for 2015. Look, let’s be honest with ourselves. Comic book videogame adaptations have never been anything to write home about. At least not until 2009, when Rocksteady Studios, a London-based game developer with only one other game to their name, released Batman: Arkham Asylum. Moody, atmospheric and dark, Arkham Asylum was everything fans love about Batman, but for the first time, they were a part of the story. An even more popular sequel followed in 2011, Batman: Arkham City, which expanded on the story and environment of the first game while introducing even more of Batman’s ever popular rogue’s gallery. Like Asylum, City won a variety of awards, made plenty of year end “Best Of” lists, was dubbed by Game Informer as “the best licensed video game ever made” and even snagged the Guinness World Record for “Most Critically Acclaimed Superhero Game Ever” from its previous holder, Arkham Asylum. You’d better believe there was going to be another Arkham game. But it took four years before Rocksteady finally unveiled their trilogy’s finale. Batman: Arkham Knight was released on June 23, 2015, and boasted what is arguably the franchise’s darkest and most dramatic story, as well as an entire new avenue of gameplay featuring the Batmobile. It introduced an original villain, the Arkham Knight, and arrived on the heels of a series of trailers that ominously teased that we’d be witnessing the death of Batman. It was a fitting end to Rocksteady’s trilogy and a great signoff for the development team who have brought a newfound legitimacy and popularity to licensed comic book videogames. Rocksteady and their trilogy helped pave the way for games like Injustice: Gods Among Us and any other epic, story-driven super hero games you may see going forward. Furthermore, they proved that movies, TV and comic books aren’t the only mediums that can create their own unified comic book universes. The “Arkhamverse” is every bit as robust, well developed and vibrant as Batman’s comic book universe or his big screen “Nolanverse.” It’s hatched its own mythology, and that mythology has expanded beyond Rocksteady’s trilogy. In 2013, Warner Bros. Games Montreal released Batman: Arkham Origins, a game set before the events of Arkham Asylum and the first Arkham game not developed by Rocksteady. In 2014, we saw the home entertainment release of Batman: Assault on Arkham, an animated film set within the world of the Arkham games. Next year, the Arkhamverse will go mobile with the decidedly different Batman: Arkham Underworld. 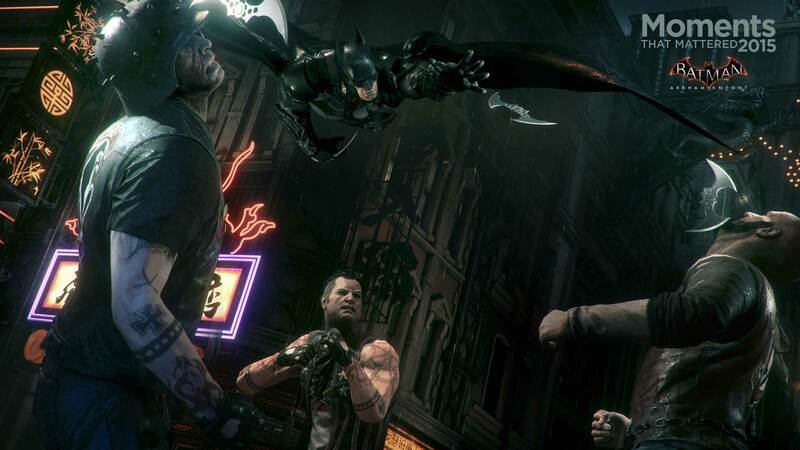 Batman: Arkham Knight may be Rocksteady’s last entry in the franchise, but will it prove to be the last Arkham console game? Only time will tell, but if we’ve learned anything, it’s that you should never count Batman—or the Joker—out.